Heart Failure: Prevalence and Prevention - Module 1 defines heart failure and discusses the lifestyle changes as well as pharmacologic and interventional strategies commonly recommended to individuals at high risk for heart failure. HF Module-2 will discuss management of symptoms associated with structural heart disease common to heart failure and its treatment. HF Module-3 will discuss the positive and negative psychological constructs associated with cardiovascular disease and HF. "HF is a complex clinical syndrome that results from any structural or functional impairment of ventricular filling or ejection of blood (2013 ACCF/AHA)." 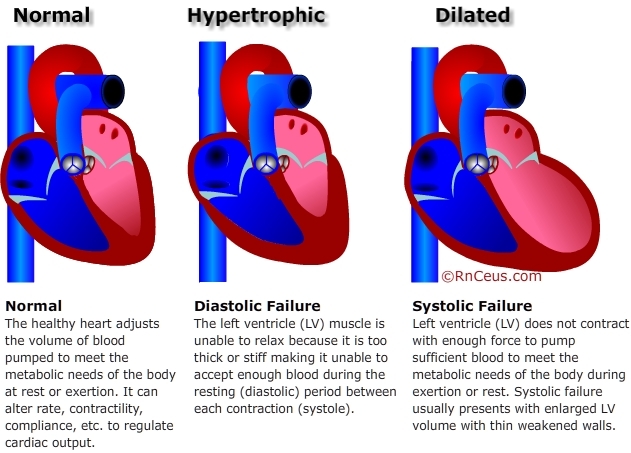 Systolic failure: the heart cannot pump with enough force to eject enough blood into the circulation because the left ventricle (LV) has lost its ability to contract forcefully. In the event that the LV ejects less than 40% of its volume the condition is called heart failure with reduced ejection fraction (HFrEF). Diastolic failure (also called diastolic dysfunction): the LV loses its ability to relax normally because it is too thick or stiff. The LV may be able to contract forcefully but it can't relax and stretch to accept enough blood to meet the metabolic needs of the body. If the LV is able to eject 50% of its end diastolic volume but that volume is insufficient to meet the needs of the body, the condition is known as heart failure with preserved ejection fraction (HFpEF). Heart Failure (HF) is a significant public health problem affecting millions of patients in the United States. Risk factors for developing HF include age, race, overweight or obesity, diabetes, history of heart attack, familial cardiomyopathy and some congenital heart defects. Heart healthy diet including vegetables, nuts, fruit, low-fat dairy, fish, lean meats. Limit consumption of sodium, saturated and trans fats, added sugars, and alcohol. Manage life stress. Stress can contribute to high blood pressure and other cardiovascular risks. Routine physical activity - Aerobic exercise, such as brisk walking at least 2 hours and 30 minutes per week, or vigorous aerobic exercise for 1 hour and 15 minutes per week. Smoking cessation can reduce the risk of death from coronary heart disease and heart attack more than any other treatment or intervention (Critchley, 2003). Avoid second hand smoke. Hypertension and coronary heart disease are strongly associated with HF. Seeking medical treatment for hypertension and adherence to the medical treatment plan are key steps in HF prevention. ACE inhibitors lower blood pressure and may reduce the risk of a future heart attack. Aldosterone receptor antagonists reduce the effects of aldosterone, including sodium and water retention, potassium excretion as well as cardiovascular fibrosis and remodeling. Angiotensin receptor blockers relax blood vessels and lower blood pressure to decrease the heart’s workload. Beta blockers slow the heart rate and lower blood pressure to decrease the heart’s workload. Diuretics (fluid pills) manage hypertension and fluid overload by increasing the excretion of sodium and water. Peripheral vasodilators including isosorbide dinitrate/hydralazine hydrochloride These drugs can reduce the risk of early death in blacks with heart failure (Cole, 2011). A meta-analysis of data from major trials demonstrated that statin therapy modestly reduced the risk of non-fatal HF hospitalization and the composite outcome of HF death and non-fatal hospitalization over 4.3 years (Preiss, 2015). Yancy C.W., Mariell J., Biykem B., Javed B., Casey D.E., Drazner M.H., et al. (2013). 2013 ACCF/AHA Guideline for the Management of Heart Failure. Journal of the American College of Cardiology. 62 (16). Cole, R.T., Kalogeropoulos, A.P., Georgiopoulou, V.V., Gheorghiade, M., Quyyumi, A., Yancy, C. et al. (2011). Hydralazine and isosorbide dinitrate in heart failure: historical perspective, mechanisms, and future directions. Circulation,123,2414–2422. Preiss, D., Campbell, R., Murray, H. et al. (2015). The effect of statin therapy on heart failure events: a collaborative meta-analysis of unpublished data from major randomized trials. European Heart Journal 36 (24), 1536-1546.